Air transport gripped the imagination, Tasmanian and worldwide, after the first powered flight by the Wright brothers in 1903. The first flight in Tasmania was made by Delfosse Badgery, a New South Wales grazier, who shipped his biplane to Tasmania in September 1914 and made short flights for entertainment at the Hobart and Launceston showgrounds, charging an admission fee. Interest intensified after the First World War. Tasmania's first unofficial airmail flight occurred in 1919 when Lieutenant Arthur Long left Hobart in a Boulton-Paul bi-plane shortly before 7 am with a compass, a map and a bag of unfranked letters. Soon lost in cloud, he emerged over Maria Island and flew back to Ross to regain his bearings, with his passenger throwing out bundles of the Mercury in what was reckoned to be the first aerial delivery of a newspaper in Australia. Flying as low as 60 feet to identify towns, where large crowds followed his progress, he reached Launceston triumphantly at midday. Several months later, he flew from Stanley to Melbourne in the first Bass Strait crossing. In 1926, two Fairey seaplanes brought officials from the Point Cook (Victoria) Aviation School to interview Tasmanian applicants for the RAAF. Large crowds flocked to see the landing on the Tamar and at the Hobart Regatta the following day. The Tasmanian Aero Club, formed at Launceston in 1927, sponsored the 1928 visit of Squadron Leader Bert Hinkler. Acclaimed as one of the greatest solo long-distance flyers, he was a national hero after his recent record-breaking flight from England to Australia. He spent eight days in the state, attended by massive and adoring crowds at every stop. Businesses closed, schoolchildren received a holiday, and many receptions were held during his visit, which did much to promote civil aviation. In the south, aviators usually landed at Elwick racecourse, where in 1928 Captain Lancaster and Mrs Miller landed perfectly, despite the boggy ground, before a crowd of 25,000. Meanwhile, Tasmanian navigator Harold Gatty was changing the course of aviation history with his invention of ground-speed and drift indicators, which were instrumental in Roscoe Turner's 1929 flight across the USA and Wiley Post's round-the-world flight in 1931. Recognising the Aero Club's numerical and financial strength, the commonwealth government purchased land at Western Junction for an aerodrome, which was completed in 1930, and flying instruction began in two Gipsy Moth De Havilland aeroplanes lent by federal authorities. The comprehensive training included night flying and acrobatic manoeuvres such as loops, spins, half rolls and stall turns. In 1931, the club extended its operations to the south by leasing a private aerodrome at Brighton, and landing grounds were prepared in Latrobe and Wynyard. Flying competitions and aerial pageants stimulated public interest, as did the Glider Club's field days at Goodwood, Brighton and Old Beach. Regular commercial airline operations in Tasmania appeared in February 1931 when Charles Kingsford Smith's Australian National Airlines began services between Melbourne, Hobart (using the Brighton aerodrome) and Launceston. ANA also gave joyrides, for example flying as far as Port Davey. A combination of a disastrous air crash in New South Wales and the Depression caused flights to stop in June 1931. Kingsford Smith tried to revive his fortunes in November with an air mail service starting at Brighton and ending in London, but this plane crashed too, in Malaya, and the first Australian National Airlines failed. In 1932 L Johnson began a service between Flinders Island and Launceston. Shortly after, so did the Holyman family, who had run a successful shipping business from Launceston for ninety years. The two services combined, started a Melbourne service the following year and in 1934 obtained the government contract for carrying airmail. But flying with primitive aids was a hazardous occupation, particularly over Bass Strait: twelve lives were lost when 'Miss Hobart' disappeared in Bass Strait with no survivors in 1934, and a Flinders Island crash in 1935 saw five killed. Aerodromes opened at Latrobe, Wynyard and Smithton in the early 1930s, and in the south, the government's choice for an aerodrome site was Cambridge, because of its proximity to Hobart (despite the ferry crossing); plentiful flat, firm ground; and few fogs. Holyman's Airways (which became Australian National Airlines in 1936 and ultimately Ansett Airlines) began flights from Hobart to Launceston in 1934 from Brighton, then in 1935 moved to Cambridge. Flights sometimes had only one intrepid passenger or occasionally none, but the twelve-seater planes still flew with the mail. It was a long day for travellers: the ferry left at 7.40 am and they reached Melbourne at 12.30 pm, or Sydney at 5 pm, after five flights. 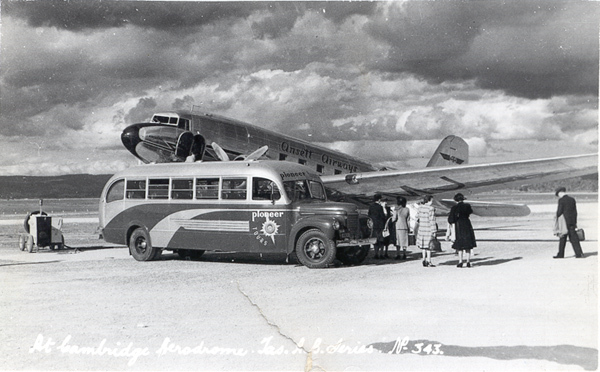 Although the post-war years saw increased tourism and services by Trans-Australia Airlines (TAA, established 1946, later bought by Qantas) and Ansett Airlines, air travel remained a relative novelty as both costly and risky. Tasmania's worst air accident occurred in 1946 when an ANA DC-3 airliner crashed into the sea off Seven Mile Beach, killing all 25 people aboard. As flying became more common and the number of flights increased, it was clear that Cambridge airport was only suitable for light aircraft. A new site was chosen nearer Frederick Henry Bay, and Llanherne airport, then one of Australia's most modern terminals, opened in 1956. Devonport's airport opened in 1952, and after controversy over two airports in close proximity, Wynyard was upgraded and renamed Burnie in 1987. For many years the state was serviced by only two airlines, with TAA/Qantas and Ansett planes taking off and landing almost simultaneously. Hobart's international terminal, opened in 1983, was used for seventeen years by Air New Zealand's direct flights between Christchurch and Hobart but, apart from a handful of summer charter flights from Singapore, has been under-utilised since the demise of the short-lived Impulse Airlines. It currently accommodates Jetstar. Airline shake-ups in 2001 saw the collapse of Ansett, and the start of Virgin Blue's 'no-frills' service out of Launceston, which was extended to Hobart the following year. While Qantas continues to service the upper end of the travel market and the business sector, its low-cost carrier, Jetstar, began a Tasmanian service in 2004, using Boeing 717s. The tourism industry is currently booming as discount airline competition has brought lower fares, regular flights and increased capacity. Air travel is also used by about 200 'knowledge workers' who commute to the mainland, as well as exporters to south-east Asian markets. Further reading: A Alexander, The eastern shore, Rosny Park, 2003; The Tasmanian cyclopedia, Hobart, 1931; Mercury, 18 June 2003; P Richardson (ed), On the tide, Launceston, 2001; M Sharland, Once upon a time, Hobart, 1976.